Chinese President Xi Jinping and First Lady Peng Liyuan were in Sri Lanka last week. His historic visit will bolster trade, investment and mutual cooperation between the two countries. 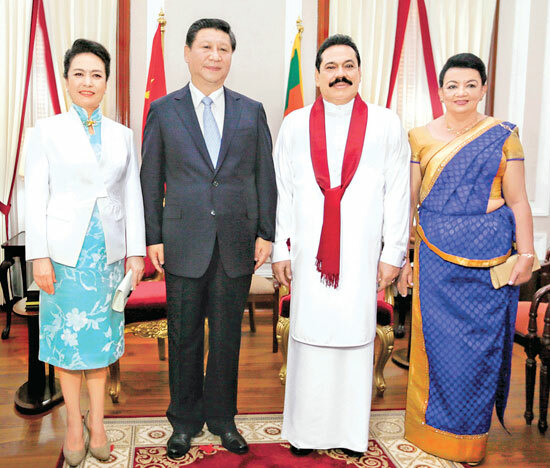 Here the Chinese President and his wife pose with President Mahinda Rajapaksa and First Lady Shiranthi Rajapaksa. The Chinese President Xi Jinping’s visit and strengthening China-Lanka ties will provide many economic benefits to Sri Lanka, economic analysts said. Increasing trade with China, especially our export to China will help diversify our export market. Sri Lanka exports, mostly textiles and garments (40 percent of the total exports) and tea (17 percent). The business community and industrial chambers commended President Mahinda Rajapaksa’s decision to reduce electricity and fuel prices to mark Chinese President Xi Jinping’s state visit last week. Industrial Development Board Chairman and Advisor to the President, Nawaz Rajabdeen said that the reduction in energy prices was a great relief for industries and the people who could save that money and invest on it developing their livelihood.